Today I received my first dividend through Robinhood. 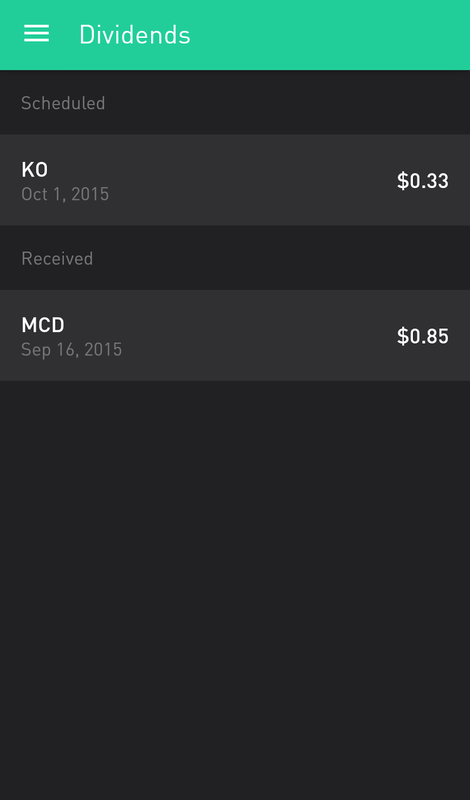 The dividend was $0.85 from McDonalds (MCD). I had previously posted that I would give an update on when I actually received the dividend. I believe I received the dividend after the markets closed today. Robinhood said the dividend was scheduled for September 16th, and after the markets closed today, I had the $0.85 added to my Cash and Buying Power. I didn't see the dividend amount added in the morning, and I didn't check before the market closed, but I can only assume it processed after the market closed. 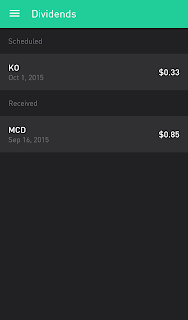 You can see from the picture below that the MCD dividend changed from "Scheduled" to "Received". Also, if you're looking at the two stocks from the picture, you may think that Coca-Cola (KO) and MCD are not "healthy" companies and don't align with the Health part of my blog. There are reason I bought those stocks, and I will discuss that at a later time. I am excited about receiving the dividend on the day it was scheduled, and am looking forward to having this part of the app filled with many scheduled and received dividends.